A microtiter plate was coated overnight with various antigens at a concentration of 5 μg/ml. After washing and blocking with PBST+5% BSA, Human Anti-Bevacizumab:HRP Antibody, clone AbD16748_hIgG1 (HCA184P) was added at a concentration of 2 μg/ml in HISPEC Assay Diluent (BUF049A). Detection was performed using QuantaBlu Fluorogenic Peroxidase Substrate. A microtiter plate was coated overnight with recombinant human VEGF protein at a concentration of 1 µg/ml. After washing and blocking with PBST+5% BSA, a pre-incubated mixture of bevacizumab (0.3 μg/ml) plus increasing concentrations of Human Anti-Bevacizumab Antibody, clone AbD16748 (HCA184). Free bevacizumab, still capable of binding to the human VEGF coated plate was detected using Mouse Anti-Human IgG (Fc) CH2 Domain:HRP (MCA647P) in HISPEC Assay Diluent (BUF049A) followed by QuantaBlu Fluorogenic Peroxidase Substrate. Data are shown as the mean of three measurements. A microtiter plate was coated overnight with Human Anti-Bevacizumab Antibody, clone AbD17976 (HCA182) at a concentration of 1 µg/ml. 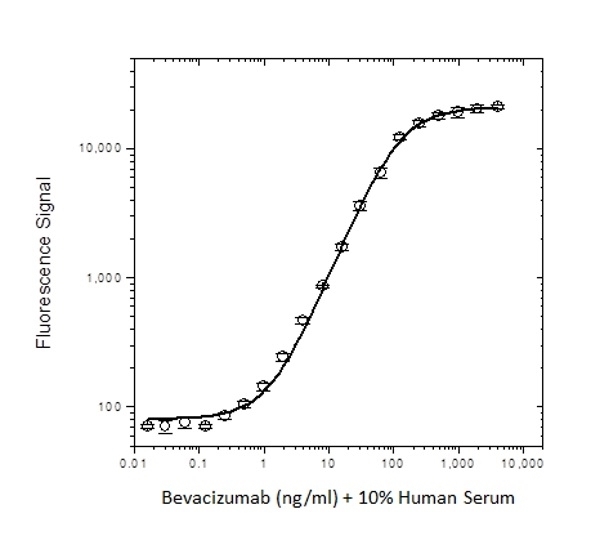 After washing and blocking with PBST+5% BSA, 10% Human Serum was added spiked with increasing concentrations of bevacizumab. Detection was performed by Human Anti-Bevacizumab:HRP Antibody, clone AbD16748_hIgG1 (HCA184P) at a concentration of 4 µg/ml in HISPEC Assay Diluent (BUF049A) and QuantaBlu Fluorogenic Peroxidase Substrate. A microtiter plate was coated overnight with bevacizumab at a concentration of 0.5 µg/ml. After washing and blocking with PBST+5% BSA, Human Anti-Bevacizumab Antibody clone AbD16748_hIgG1 (HCA184) in PBST + 10% Human Serum was added. Detection was performed using HRP conjugated bevacizumab at a concentration of 2 µg/ml in HISPEC Assay Diluent (BUF049A) and QuantaBlu Fluorogenic Peroxidase Substrate. Anti-bevacizumab antibody is a recombinant, neutralizing anti-idiotypic antibody in fully human IgG1 format; it is suitable for bioanalytical method development. It can be used as the detection antibody in a PK bridging ELISA with HCA182, and as a reference standard in an ADA bridging ELISA. Human Anti-Bevacizumab Antibody, clone AbD16748_IgG1 is a paratope-specific, recombinant anti-idiotypic antibody that specifically recognizes the humanized monoclonal antibody drug bevacizumab and inhibits the binding of the drug to its target, vascular endothelial growth factor A (VEGF-A). 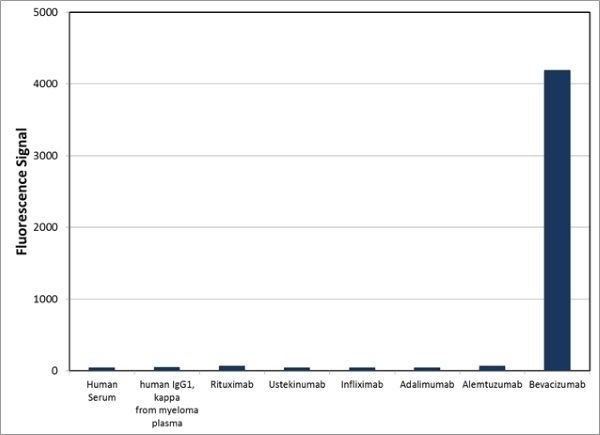 The antibody can be used to measure the levels of bevacizumab and biosimilars in serum from patients. 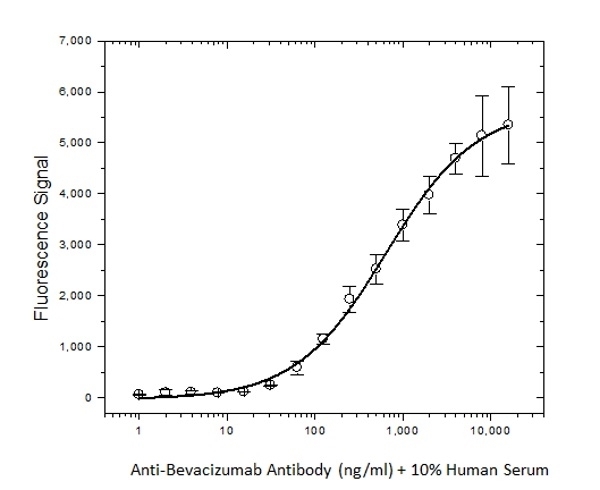 A pair of anti-bevacizumab antibodies can be used to develop a pharmacokinetic (PK) bridging ELISA to measure free drug. This antibody is recommended as the detection antibody, paired with Anti-Bevacizumab Antibody in monovalent Fab format, clone AbD17976 (HCA182) as the capture antibody. 97.8% (capillary electrophoresis, reducing conditions). 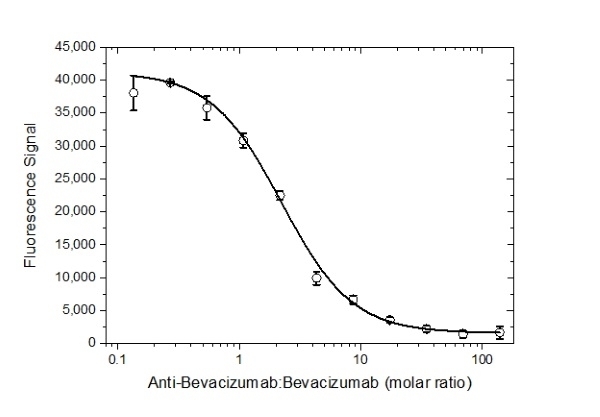 The monovalent intrinsic affinity of this antibody was measured as KD=2.1nM by real time, label-free molecular interaction analysis on immobilized Bevacizumab. This product may be used in a direct ELISA or as a detection reagent in a sandwich ELISA together with HCA182 as the capture reagent. This product may be used in a direct ELISA or as a detection reagent in a sandwich ELISA, when conjugated to HRP, together with HCA182 as the capture reagent.